Time Saving: this sheep shears can clip 5-10 sheep in an hour, it is very suitable for family or pasture farming. Labor-saving: the structure of handles are in ergonomic design, and it is non-slip, you will not be fatigued for a long time shearing. 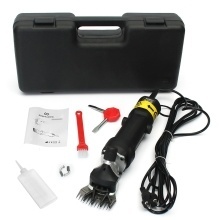 Easy to Operate: excellent high speed wool clipping design, compact structure with light weight, flexible and reliable operation, suitable for shearing beginners. Adjusting Speed: 6 adjustable speed to control the shearing speed more precisely, suitable for family farms, pasture breeding, etc. Professional Electric Shears: adopt with advanced power technology, strong power, and low frequency heatsink with speedily heat dissipation. Wide Application: suitable for most crossbred sheep, fine wool sheep and adhesive wool, can leave a certain thickness of the wool layer in winter shearing. Excellent Fur Shaving Tool: high speed wool clipping design, little vibration and low working temperature, easy to maintenance.